The conventional wisdom in the battle for control of the U.S. House of Representatives is that Democrats will pick up at least some seats, perhaps netting somewhere in the high single or low double digits, but won’t pick up enough seats to seriously threaten John Boehner’s speakership. Indeed, if we had to project the House right now, we’d say a net Democratic gain of less than 10 seats. One possible but highly unlikely outcome — at least at this point — is that the Democrats overperform and recapture the House majority by netting 25 or more House seats. And equally unlikely but also possible is this: The Republicans winning their biggest House majority since before the Great Depression. Republicans currently hold 242 House seats, which is their biggest majority since 1946, when a postwar backlash against the Democrats and President Harry Truman gave Republicans 246 House seats. That was the first time Republicans had won the majority since 1928, when, in the election that swept Herbert Hoover into the presidency, Republicans won an impressive 267 seats. Two years later, after the stock market crashed, Democrats narrowly won the House majority and kept it through the Great Depression and World War II. In order to exceed their 1946 majority, Republicans would have to net an additional five seats. But given that Republicans cut so deeply into Democratic territory in 2010, that’s a very difficult proposition. It would probably take a Mitt Romney romp, and even then, Democrats might still gain seats because of their many opportunities in states that under no circumstances will go to Romney, such as California, Illinois and New York, where Democrats are hopeful they can net a combined 10 seats or more. Remember that even in 1992, when Republican George H.W. Bush was unceremoniously kicked out of the White House, his Republican Party netted 10 House seats. One way to determine which way the pendulum is swinging as November approaches is to monitor the toss-up races in the House. We see only 15 toss-ups right now — about 3.5% of all 435 House races. If Democrats win a strong majority of these races, they will make good on the conventional wisdom and add seats in the House. Meanwhile, if in the unlikelier event that the Republicans manage to grab a solid majority of these seats, it could be an indication that they might actually add to their majority. — Illinois 12 (Rep. Jerry Costello retiring; 2008 Obama/McCain district performance: Obama 55, McCain 44) — Democrats are on their third candidate in this district, after Costello decided to retire and former school administrator Brad Harriman, who won the March primary, withdrew because of health problems. Next up is retired Illinois National Guard commander Bill Enyart, who national Democrats preferred as a replacement for Harriman. On the surface, this is the sort of district where Republicans should have their best opportunities in the Age of Obama: large, economically depressed and about 80% white. But, remember, this is Illinois, the president’s home state, and the district is ancestrally Democratic: Just two men (Democrats Mel Price and Costello) have held the seat since 1944. Republican Jason Plummer, the party’s nominee for lieutenant governor in 2010, is the GOP nominee. He’s wealthy and can self-fund, but Democrats feel he is vulnerable to attacks over releasing his tax returns. — Pennsylvania 12 (Rep. Mark Critz; 2008 McCain 54, Obama 45) — Critz impressively defeated fellow conservative Democrat Rep. Jason Altmire in the April primary after Republicans drew the two congressmen into the same district during redistricting. After his win, Critz is trying to distance himself from President Obama; Critz is among a small but growing number of endangered House Democrats who will not be attending the Democratic National Convention. That’s probably a wise move, given that Obama is likely to do quite poorly in Western Pennsylvania — perhaps worse than in 2008, when he only won four of its 26 counties. Critz’s opponent is attorney Keith Rothfus, a narrow loser to Altmire in 2010. — Rhode Island 1 (Rep. David Cicilline; 2008 Obama 67, McCain 32) — Losing this seat would be an utter calamity for Democrats — if it flipped, RI-1 would be, by several points, the most Democratic seat held by any Republican. But Cicilline’s approval ratings are abysmal thanks to baggage from his previous job as mayor of Providence, and he faces not only a challenge from businessman Anthony Gemma in the primary, but also a tough test in the general election from former state Police Superintendent Brendan Doherty. Still, while Cicilline appears to be in trouble, it’s also hard to imagine Democrats ultimately losing such a seat — and, even if they do, it’s one the Republicans probably wouldn’t be able to hold for long. — Utah 4 (Rep. Jim Matheson; 2008 McCain 56, Obama 41) — As he took the reins of the Utah Republican Party in early 2011, party Chairman Thomas Wright announced that one of his major goals was to defeat “that rascal Jim Matheson.” That a Democrat holds one of the four House seats in perhaps the country’s most Republican state is certainly galling to the state GOP, but Matheson has persistently frustrated Republicans since his first election in 2000. As it stands, if Matheson is reelected he will likely be the Democrat holding the most Republican seat in the nation. Mia Love, the mayor of Saratoga Springs, would be the first black female Republican ever elected to the House if she beats Matheson, but an independent poll showing Matheson up 53% to 38% over Love indicates it won’t be an easy task. If Republicans can’t beat Matheson this time with a promising challenger and a Mormon Republican at the top of the presidential ticket, it’s difficult to see them ever beating him. Matheson, like Critz, is skipping the Democratic convention — but that’s no surprise, given that he’s never attended. — California 52 (Rep. Brian Bilbray; 2008 Obama 55, McCain 43) — An excellent recent National Journal analysis, which showed how California’s June 5 primary probably had a Republican-leaning turnout, illustrates the challenges Bilbray faces in winning reelection. Bilbray’s San Diego-area district became several points more Democratic in redistricting, and he only got 41% in the all-party primary (Republican candidates won 48.8% of the vote, to 46.3% for the Democrats). However, Democratic turnout should increase in the fall, to the probable benefit of Democratic nominee Scott Peters. This is the best opportunity for Democrats to unseat a Republican incumbent in California, where they need to net several seats in order to really put the House in play. — California 7 (Rep. Dan Lungren; 2008 Obama 51, McCain 46) & 26 (Rep. Elton Gallegly retiring; 2008 Obama 56, McCain 41) — Lungren’s 52.7% performance in the top-two primary (Democratic challenger Ami Bera’s 41%) indicates that he starts with an advantage over Bera, even accounting for the fact that the electorate in this Northern California district should be more Democratic in the fall. Still, this one could go either way, especially since Bera came within seven points of beating Lungren in 2010 in a district that was a few points more Republican. Meanwhile, in a more Democratic district north of Los Angeles, state Sen. Tony Strickland (R) is battling state Assemblywoman Julia Brownley (D) for this competitive, open seat. Democrats worried Brownley wouldn’t get past the all-party primary, but she finished ahead of an independent former Republican to advance to the general. These seats are grouped together because Republicans probably start off with the advantage, but they remain toss-ups in our ratings. — Minnesota 8 (Rep. Chip Cravaack; 2008 Obama 53, McCain 45) — Cravaack was one of the shock winners on election night 2010, as he narrowly defeated long-time Democratic Rep. James Oberstar in this Democratic-leaning northeastern Minnesota district. Democrats see him as one of the most vulnerable Republican incumbents in the country — which is true — but they first need to pick a challenger in the Aug. 14 primary. Ex-Rep. Rick Nolan (he served from 1975-1981) has party support, but ex-state Sen. Tarryl Clark has been the better fundraiser, probably in part because she unsuccessfully challenged Rep. Michele Bachmann in 2010 (ex-Duluth City Councilor Jeff Anderson is also battling for the nomination). No matter his opponent, Cravaack — who faces residency questions because his family lives in New Hampshire — faces a rough road. — New Hampshire 1 (Rep. Frank Guinta; 2008 Obama 53, McCain 46) & 2 (Rep. Charlie Bass; 2008 Obama 56, McCain 43) – All the top races in New Hampshire, that most politically active of states, are toss-ups this year: president, governor and both House seats. Guinta and Bass, elected in 2010, will likely face rematches: Ex-Rep. Carol Shea-Porter is challenging Guinta, and Ann McLane Kuster will take another shot at Bass. Going into the election season, Guinta seemed like he was in a stronger position (he won by about 11.5 percentage points in 2010, while Bass only won by 1.5 points), but public polling has seemed to indicate he is in slightly worse shape than Bass, and both rematches are tight. — Nevada 3 (Rep. Joe Heck; 2008 Obama 54, McCain 45) — Heck knocked out Rep. Dina Titus (D) in the 2010 wave, and it seemed possible that she would try for a rematch. But Rep. Shelley Berkley’s (D) decision to run for Senate opened up her safe Las Vegas seat, giving Titus an easy path back to the House and leaving state Assembly Speaker John Oceguera (D) to challenge Heck. Oceguera hasn’t exactly set the world on fire as a candidate, drawing the ire of Nevada political guru Jon Ralston for “reverting to hollow talking points that a Democratic National Committee boiler-room teenager could have provided” while appearing on Ralston’s television show in May. Then again, Heck had a bad headline last week when Politico reported that his wife received unemployment benefits last year; she lost her job at her husband’s medical training company because he dissolved it after he was elected. Potentially more important in this race than the performance of the candidates is the performance of Barack Obama and Mitt Romney at the top of the ticket, and their respective turnout machines. — Ohio 16 (Rep. Jim Renacci [R] running against Rep. Betty Sutton [D]; 2008 McCain 51, Obama 47) — When Ohio Republicans redrew the Buckeye State’s congressional districts, they sacrificed one of their own members (Rep. Steve Austria) in order to lock in what they hoped would be a solid 12-4 Republican advantage in the state’s congressional delegation. But Sutton, whose safe Democratic seat was dismantled, could upset their plans by defeating freshman Renacci. This could be one of the nation’s priciest congressional races, especially because the district’s redraw moved it north to include parts of Cleveland’s western and southern suburbs (hence giving political advertisers more bang for their buck from the Cleveland media market). We suspect that, of all the Crystal Ball’s Republican-held toss-ups, this is the hardest lift for Democrats: In addition to having the strongest McCain 2008 performance of the 11 GOP-held seats described here, it also is the only one specifically drawn by Republicans to favor their candidate. — Texas 23 (Rep. Francisco “Quico” Canseco running for reelection; 2008 Obama 50, McCain 49) — This race could feature yet another rematch, but that won’t be the case if Democrats get their way. Freshman Canseco defeated ex-Rep. Ciro Rodriguez in 2010, and while Rodriguez wants another shot at getting his job back, national Democrats favor a different candidate, popular state Rep. Pete Gallego, for the nomination. Rodriguez finished ahead of Gallego in the May 29 primary, but they will square off again in the July 31 runoff. Amazingly, of 36 House seats in Texas, this is the only one we list among the nation’s competitive races. Democrats should be able to win at least majority of these races: 12 of the 15 are in districts that Obama won in 2008, only two reside in states McCain won in 2008 and only three feature Republicans who have been elected more than once (that includes New Hampshire’s Charlie Bass, who lost a reelection bid in 2006 only to come back in 2010). Looking at the toss-ups, one can see how Democrats can chip away at the Republican advantage in the House. 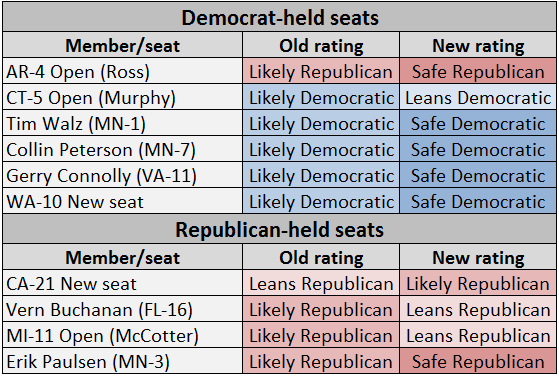 Based on our current ratings, 234 seats are either safe, likely or leaning to the Republicans, 186 are safe, likely or leaning to the Democrats and 15 are toss-ups. If the Democrats can win, say, 10 of the 15 toss-ups, that would give them 196 seats, or a net gain of three seats. And the Democrats have more opportunities to put Republican seats in play than vice versa: some seats we currently list in the leans Republican column, such as those of Republicans Dan Benishek (MI) and Reid Ribble (WI); embattled but formidable Democrats Kathy Hochul (NY) and Mike McIntyre (NC); the member vs. member contest between Leonard Boswell (D) and Tom Latham (R); and others could very well fall into the toss-up column before too long. Meanwhile, Democrats might lose the advantage in one or more of the four Republican-held seats we favor them to win in Illinois and in some Western and Northeastern seats as well. In an effort to provide the clearest possible state of play in the House, we are trying to limit the number of toss-ups. Expect constant tweaking in the weeks and months ahead. Most of these changes just represent housekeeping by removing seats that are no longer competitive, or never became competitive. Moving AR-4 (where Democratic Rep. Mike Ross is retiring) to safe Republicans means that there are now two seats currently held by Democrats that are now effectively in the Republican column: it and NC-13, which Republicans drew to force incumbent Rep. Brad Miller’s (D) retirement. One race to watch: an investigation into Rep. Vern Buchanan’s (R-FL) fundraising and business practices was featured in a CNN report last week, which is more evidence that the National Republican Congressional Committee’s fundraising chairman and third-term congressman goes into this election under a dark cloud. Ex-state Rep. Keith Fitzgerald is Buchanan’s likely opponent in this competitive McCain district; as it stands now, we’re downgrading Buchanan, but he’s still a favorite. Connecticut state House Speaker Chris Donovan (D), once considered a relative shoo-in to win the seat of Rep. Chris Murphy (a Democrat now running for U.S. Senate), is also facing some heat of his own after a fundraising scandal embroiled several aides. Democrats should hold this seat, but if Donovan is the nominee he might kick it away; likewise, Rep. Thaddeus McCotter’s (R-MI) embarrassing failure to qualify for the ballot means that his Republican-leaning district is also more competitive. To see our House ratings for all 435 seats, just visit the Crystal Ball’s House race page.